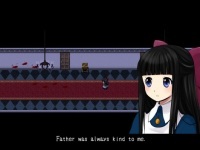 In the game: Mad Father, you are invited to get involved in a scared plot with a child named Aya Drevis. She is a lonely girl after her mother passed away. Along with her father and Maria, her father's assistant, she goes through life in scared atmosphere because of the profession of her father in laboratory. Find out more about her father and her everyday life in this adventure-RPG game.